Commercial lawn mowers are built to do hard work over and over again. When you compare a commercial mower to a consumer model, you’ll notice that there are key differences. For example, commercial-grade engines can handle mowing all day long day after day. But residential lawn mowers are designed to run only a few hours a week. Also, commercial cutting decks are more durable for higher blade speeds. They can handle tough weeds and tall grass more easily than a consumer mower. If you want the best lawn mower that money can buy, invest in a commercial mower. It will outlast and outperform a residential model and potentially save you money in the long run. The Swisher Z3166CPKA Big Mow is an American-made commercial-grade zero turn radius mower. It has an enormous 66-inch cutting deck to help it cut large areas as quickly as possible. And it can mow at speeds up to 10mph on up to 10-degree inclines. The power behind this mower is a 31HP 4-cycle 2-cylinder Kawasaki engine with electric start. You can simply turn the key and go. The controls consist of Swisher’s patented rapid response system. These ergonomic steering posts are reminiscent of driving a tank except this mower can literally turn on a dime. The other controls make handling this mower a snap. To illustrate this, take a look at how the hydrostatic transmission gives you infinite variable speed. It’s just like using an accelerator in a car. And you can set the cutting height right from the seat with the electric deck lift system. The blade height ranges from 1 ¼ to 5 inches. Actually, we should say “blades” because there are three commercial-grade cast iron mulching blades mounted on this mower. Next, the seat itself has its own suspension system and a seatbelt, a cup holder, plus armrests. It’s designed for all-day comfort. There are even headlights to help you get an early start or finish up at the end of the day. Moreover, when you finish mowing, hit the switch to lift up the deck out of the way. While the Swisher Big Mow is excellent for mowing lawns without a lot of slopes, the Pro Trail Mower is made for cutting meadows with difficult terrain. It’s a trailer you can hitch to a lawn tractor, an ATV, or another kind of utility vehicle. In addition, it will leave the grass with a professional finish, not a rough cut. The Trail Mower runs on a 14.5HP Kawasaki engine with electric start. It has three Gator commercial mulching blades mounted on cast iron blade spindles for durability. And you can adjust the blades to cut between one and 5-½ inches in height. At the start of our article, we reviewed the 66-inch Swisher Big Mow. But here we have the second generation Swisher Response with a 60-inch cutting deck. Its top speed is 8mph both forward and reverse. The Kawasaki engine is a little smaller, but it comes with a hydrostatic transmission and Ogura clutch. Instead of lap bars, you’ll drive this mower with Swisher’s rapid response control system. Based on everything we have seen, this steering method is very comfortable for long hours of mowing. It consists of two ergonomic control sticks positioned so that you can grasp them while resting your arms on the armrests of the seat. It doesn’t take a lot of movement on the driver’s part to make the mower turn. The Response mower comes with three Gator mulching blades that you can adjust between 1 ½ to 4 ½ inches in height. They will leave your lawn with a manicured finish. But keep in mind that the Swisher zero turn radius mowers can’t bag clippings. Although you can purchase accessories like a dump cart and a snowplow blade, there is no bagging attachment. Husqvarna makes several commercial-grade lawn mowers. The MZ54S is a zero turn radius mower with a 54-inch cutting deck. It runs on the Briggs & Stratton Endurance Commercial 25HP engine. One of the highlights of this mower is its air induction technology that lifts grass toward the blade for a better cut. You can adjust the cutting height with a pedal on the deck. And the deck itself is reinforced with flat-stock steel for extra strength. Many homeowners opt for the Husqvarna mower instead of the Swisher simply because the Husqvarna can bag clippings. Although it doesn’t come with a bagger, it’s possible to mount a blower-assisted collection system. The original Swisher Response comes with a 54-inch cutting deck. It has a 24HP Professional Series Briggs & Stratton engine instead of a Kawasaki. But it has a hydrostatic transmission plus an Ogura clutch. And it can mow at 8mph. The three Gator mulching blades cut the lawn quickly, but manicure the grass as nicely as a push mower. Moreover, you can bring other equipment along for the ride because the mower has both front and rear hitches. The Ariens APEX zero turn mower relies on a 23HP Kohler 7000 Series V-Twin engine. It mows up to 8mph and can travel in reverse up to 4mph. In addition to this, its rugged 10-gauge welded steel deck is covered by a five-year warranty. The APEX mower has an interesting method for setting the cutting height. You select between 1 ½ to 5 inches by inserting a pin into a slot. Each slot represents a quarter-inch increment. Then it’s only a matter of using the foot pedal to raise or lower the deck. 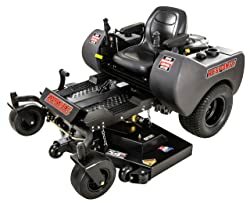 Other features of this mower include a deck access panel that reveals the blade spindles and drive belts. There’s also an ergonomically padded seat width armrests as well as an hour meter to keep track of when it’s time to do service. When you have overgrown areas, you’ll want the Swisher 44-inch Trailcutter. It’s a rough cut mower that you can hitch to an ATV or another utility vehicle. It won’t give you the fine finish you’d want for your front lawn, but it will cut down tall grass and brush up to 3 inches thick. The Trailcutter runs on a 14.HP Kawasaki engine with electric start. It has two commercial-grade swinging blades that adjust to cutting heights between 3 to 7 inches. Furthermore, it has two 16-inch pneumatic tires to roll over rugged terrain. And there’s even a remote operator control console so that you can run the mower from a distance. The Trail Mower hitches to lawn tractors, golf carts, or ATVs. It’s a finish cut mower with a cutting deck that’s adjustable between 1 ½ to 4 ½ inches in height. It comes with two cutting blades, and it discharges to the rear. Furthermore, it’s powered by a 12.5HP Briggs & Stratton Powerbuilt engine. The hitch on the Trail Mower allows you to offset it to the left or right side. That’s very convenient when you need to mow around obstacles. Not everyone has an ATV or utility vehicle that they can use to tow a mower. But that shouldn’t stop you from clearing ditches or cutting a trail. At least not when you have the Swisher walk-behind rough-cut mower. The 10.2HP Honda engine has recoil start with a pull cord. But after you start the engine, the job gets easier because this is a self-propelled mower. It has a four-speed transmission plus reverse to help you extricate from a difficult spot. And although you can’t change the four-inch cutting height, the single G6 commercial cutting blade can handle brush up to 1 ½ inches in diameter. This self-propelled lawn mower from Snapper may only have a 21-inch cutting deck, but it’s robust and durable. The rear wheel drive moves the mower between 1.7 to 4mph. Plus, the high-lift blade vacuums grass blades upright for a perfect cut. The mower comes with a rear bagger, but you can purchase a side discharge and mulching kit, too. If you take a closer look at the specifications, you can see why this is a commercial-grade mower. For example, the 10-inch wheels have ball bearings. Next, the mowing deck is made of 14-gauge steel with reinforced bracing. It even has a disk drive transmission. If you have a large lawn or frequent mowing to do, it may be worth your while to invest in a commercial mower. The best commercial lawn mowers get the job done faster. They’re surprisingly easy to use considering how powerful they are.